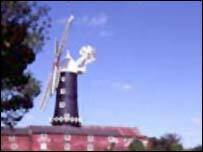 A television crew was left high and dry after their camera had to be rescued by firefighters from a 12 metre windmill sail. They were filming an advert for the National Lottery and attached a camera to Skidby Mill in East Yorkshire. But when the wind stopped blowing the sails stopped turning leaving the £15,000 camera stranded in mid-air. Firefighters from West Hull station were called to the scene at 2100 BST and used an aerial ladder platform to retrieve the equipment. Assistant division officer Paul Dent said: "It makes a change from rescuing a cat. "We are here for things like this - not just putting out fires. The camera could have fallen off and injured somebody so it was essential we got it down." Built in 1821, the windmill still grinds grain for wholemeal flour today. David Woods, National Lottery account director for advertising agency WCRS, said: "We were trying to get a shot of an enthusiastic lottery player with the camera on the sails. "But the wind stopped and once that happens there is not a lot you can do about it. "The fire service were terrific. It was a rescue with a difference."